Learning about year three social studies? Look no further than these year three social studies resources that offer targeted practise with such concepts as latitude and longitude, cardinal directions, national symbols, and the amendments. Worksheets, workbooks, activities and lesson plan help kids review material in preparation for what's to come. When you're ready, dive into our Year four social studies resources. This cherufe coloring page shows the legendary creature from Chilean folklore. Use this cherufe coloring page to introduce your child to legends from Chile. Your child will practise writing Hyderabad, the capital of Andhra Pradesh, and learn about Diwali with this delightful worksheet. 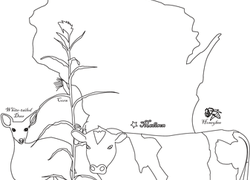 As kids colour in the fun pictures, they'll learn a little about the geography and symbols of the state of Wisconsin. People communicate online by personalizing their own websites—now give your little one a try (just for fun). See what your child's homepage would look like! After working on this worksheet, your child will be able to wave his skills to you and show you his handwriting skills! A coloring sheet of Michigan for 1st and 2nd graders, featuring the state nickname and facts. A worksheet on Vermont for 1st and 2nd graders, featuring state symbols, history and facts. Practise writing more quickly with cursive with this worksheet about puppets in the northern Indian state of Rajasthan. This family tree activity helps gets kids thinking about just how many people it took to get them where they are today. Help your students practise working on their handwriting by writing the capital of Jharkhand and learning about Rangoli, a folk art in India. Write your way through this handwriting worksheet as you learn about mehendi designs and practise writing the capital of Kerala. Teach your child to write in cursive with this worksheet about an Indian Union Territory capital. This centicore coloring page features the goat-like creature from European folklore. Use this centicore coloring page to learn about the mythological creature. Help your child learn different payment methods, and what each one is typically used for, in this easy money worksheet. 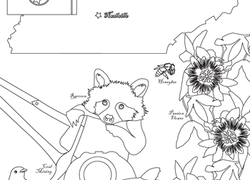 Animal-lovers will have a great time coloring in this mystery state coloring page, and they'll get in some social studies learning at the same time. Help your children practise writing in a faster form by writing the capital of the Andaman and Nicobar Islands! This hippocamp coloring page features the legendary creature that is part fish and part horse. 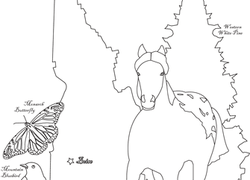 Try our hippocamp coloring page in a lesson about mythology. 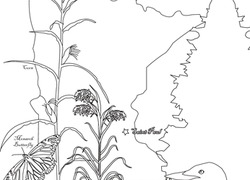 This fun printable, featuring Minnesota, is a great way to combine social studies learning with coloring time. A coloring sheet of Indiana for 1st and 2nd graders, featuring state symbols and facts. Your child will practise writing the two capitals of Jammu and Kashmir with this worksheet's double dose of fun.